PORT OF SPAIN - A 6.1 magnitude earthquake occurred west of Tobago at 5.42 pm on Tuesday, which was widely felt throughout Trinidad and Tobago as well as St Vincent and Grenada. According to the UWI Seismic Research Centre, the earthquake’s location was 11.204 north latitude and 60.852 west longitude at a depth of 26.85 km. A number of aftershocks were also recorded at magnitudes ranging from 3.5 to 4.9 and depths from 5km to 45km and were reportedly felt throughout Trinidad and Tobago. 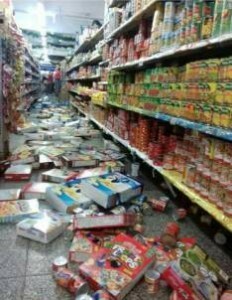 Although no one was reported injured, nor was there any infrastructural damage, food items on the shelves of several supermarkets in Trinidad toppled over with the earthquake’s prolonged tremors, the Trinidad Guardian reported. On Tuesday night, seismologist Dr Joan Latchman said the magnitude experienced on Tuesday was last felt in Tobago back in 1997. Asked if the earthquake could have been predicted, Latchman said that was a big discussion that she preferred not to engage in. However, she said she was not surprised by the occurrence of the earthquake and its magnitude. In the coming days and weeks, Latchman said Trinidad and Tobago should brace for several aftershocks.